The artists were commissioned to improve the environment of the A&E unit at St Mary’s Hospital using the local area as inspiration. Bruton was commissioned to produce an artwork for a large wall as part of the redevelopment of the Outpatients Unit at Charing Cross Hospital. Julian Opie was commissioned to create an installation of over forty works that respond to the design of the Lindo Wing, located throughout all five floors of the building. Riley worked in collaboration with the building’s architects to create three murals spanning the eighth, ninth and tenth floors of the St Mary’s Hospital QEQM building. David Mach’s sculpture Elevator was commissioned in 2006 for the Riverside stairwell at Charing Cross Hospital. Inspired by the Yorkshire landscape, Woods’ tiled work is displayed in the newly-refurbished Outpatients department at Hammersmith Hospital. Von Zwehl’s profiles of young children are on display in the birth centre at Queen Charlotte’s & Chelsea Hospital. This selection of prints was chosen in collaboration with patients and members of staff to be displayed at the Teenage and Young Adult Cancer ward at Charing Cross Hospital. Four still-life monoprints by Charlotte Verity were selected to complement a newly refurbished Early Pregnancy Unit at Hammersmith Hospital. These digital composites were inspired by both Dutch flower painting and Persian carpets and are currently on display in the IVF clinic at Hammersmith Hospital. 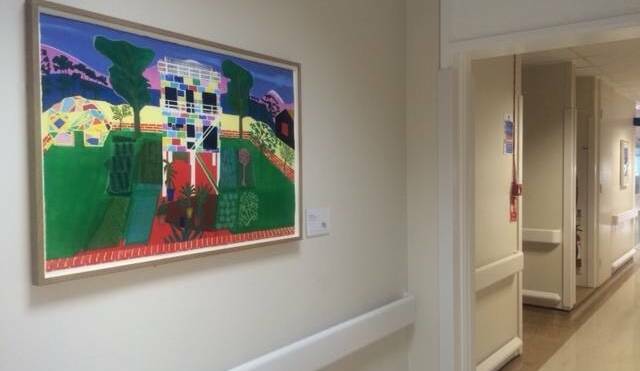 Tom Hammick’s colourful prints are hung in the Neurological Rehabilitation unit at Charing Cross Hospital. Brian Eno’s work is displayed in the Nuclear Imaging department at Hammersmith Hospital. Morris’ luminous screen-prints are on display in the Ear, nose and throat outpatients department at Charing Cross Hospital. The two bodies of work by British artist Tess Jaray are on display in the Peart Rose Clinic at Hammersmith Hospital.